Sewickley, PA -- Corry Micronics announces the introduction of their Directional Coupler product line for RF and microwave applications. The directional coupler product line consists of four types. 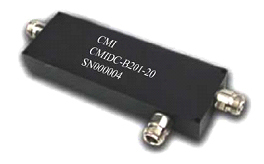 The types are lumped-element, ultra-broad band, communications band and the high current series. The directional couplers are available packaged as Surface Mount, plug-in, coaxial, SMA and N connector styles. Jim Price, Vice-President of Engineering stated "We can design directional couplers from 1MHz to 18GHz with power handling designs to 150 watts". Price went on to say that we can usually turn custom quotes in just a few days and many times have samples in customer hands in less than 2 weeks. Don Pavlek, President and CEO at Corry Micronics commented that we continue to develop and expand our products that serve commercial, military, microwave and wireless industries. Matt Cottrill, Vice-President of Sales and Marketing stated that CMI can cross most competitors' directional couplers, offer competitive pricing and with standard lead times of four weeks. Click here to download the Directional Coupler product catalog.